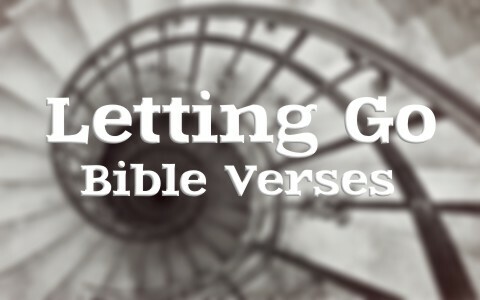 Here are ten encouraging Bible verses about letting go. When the Apostle Paul wrote that we are to let go of all bitterness, wrath, anger, clamor, and slander, he says we must make the first move. We must be intentional in letting all of these sinful behaviors go and take the initiative to be kind to others, showing tender hearts, and remembering to forgive others, especially considering how much more we’ve been forgiven. The scale of what we have been forgiven and our forgiving others is infinitely more on the scale of how much God has forgiven us in Christ. One way to let go is to be looking forward. You can’t be looking forward and backward at the same time, and “forgetting what lies behind” us doesn’t mean we can erase it from our memories. We can’t do that but that’s okay. That’s how we learn; mistakes are great teachers, but Paul is telling us to forget about it and move on. Stop dwelling on the past. Don’t trip over what’s behind you. Strain forward, not backward. Press ahead…the goals in front of you, not behind you. That prize seems closer today than it did last year doesn’t it? So keep pressing forward and let go of yesterday. Many years ago when I was on the track team in high school, I learned a valuable lesson. I was leading the race, but when I looked back, I saw another runner gaining on me. I nearly stumbled by looking back and it took my momentum away…and yes, I lost the race. Just as the Apostle Paul says we’re like runners in a race and only one receives a prize at the event, we must run as if we deeply desire to “obtain it,” but we can’t be looking back…we must learn to let go of what’s behind us. When I read this Bible verse I sometimes think of Joseph who was unfairly treated by his own brothers and then sold into slavery. From there, he ended up in prison, and again from something he was innocent of. It didn’t matter because the Scriptures say “The LORD was with Joseph” (Gen 39:2), when he was in charge of Potiphar’s house and while he was in prison (Gen 39:23). Think about that! God can use evil for His own good purposes (Gen 50:20). Why do we often carry around our own burdens when we can come to Him with all of the heavy stuff? Jesus tells us, “Come to me, all who labor and are heavy laden, and I will give you rest. Take my yoke upon you, and learn from me, for I am gentle and lowly in heart, and you will find rest for your souls” (Matt 11:28-29), because His “yoke is easy” and His “burden is light.” Why shouldn’t we? He cared for us enough to die on the cross! The Book of Philippians has been called the “Joy Epistle” or book because of its emphasis on joy. The Apostle didn’t as much command them to be joyful but tells them how they can have it. If there’s anything at all we’re anxious about, and we must all admit to that at times, we must submit it to God in prayer. We pray about everything but we also make our requests with thanksgiving. When we’re thankful, we are automatically more joyful. There were times when my son would actually come up to me and confess that he did something wrong. He learned that it’s far better to do that, than to be found out anyway. This proverb proved true for him and it does for everyone. We’re not only to confess our sins (1st John 1:9), we must forsake them. If we don’t forsake them, then have we really come before God with a clear conscience? Confessing and forsaking sins brings mercy. The context of these verses in the Book of Hebrews is that they should think about their present suffering and then, “Consider him who endured from sinners such hostility against himself, so that you may not grow weary or fainthearted” (Heb 12:3). The “Him” –the author of Hebrews is clearly Jesus Christ and Jesus looked beyond the suffering because of the joy that would come. That must be our perspective too or we’ll never let go of the past. Doesn’t this sound like a command? Does Paul actually command us to “be angry?” It appears so, but he qualifies it by saying, “do not sin.” Additionally, Paul suggests we put it to bed. That is, we must get over it and reconcile with the other person we’re angry with (hopefully, for a right reason). When we see someone hurting another, we have a right to be angry and speak up for the innocent victim (which is what Pro-Lifers do). This is called righteous indignation but it’s not right to take matters into our own hands. We must leave that to God to make all things right someday (Rom 12:17-19). God’s judgment seat is a one-seater. We don’t belong there, but we can speak up and be angry about certain social sins such as political corruption, voter fraud, taxpayer-funded abortions, and losing our freedoms promised in the Constitution. I want to encourage you that you can let go of things; even if it’s got you in its grip. The key is to let go and let God have it. We can do nothing without Christ (John 15:5), and yet everything with Him (Phil 4:13). Trust Him to give you the ability to let go of things, whatever they are: financial difficulties, relationship issues, problems with your children, addictions, you name it. He can handle the load when we cannot, so let go, but that starts with opening your hands, so that you can let it go. This may also interest you: Why Should I Trust God? Beautiful article… definitely food for my spirit and my soul… so much of what has been consuming me… I found those answers here… Thank you!!! this is very helpful specially if I will be facing life challenges and obstacles..